Crysis Coming to XBL and the PSN! 1 Comment on Crysis Coming to XBL and the PSN! PC gamers are going to shed a tear for this one but Crytek and EA announced on September 9th that the original Crysis will becoming to Xbox Live and PlayStation Networks for digital download in October. But don’t be too sad it’s only going to be an “enhanced and modified” version of the single player campaign. Crytek will be using the new CryEngine 3 to remaster the graphics with new lighting, effects and visual optimizations. Crytek also stated that the controls for the Nanosuit will be optimized along with a fine tuned combat system and full stereoscopic 3D support for total immersion into the world of Crysis! Back in 2007 when Crysis was released on the PC it was (and is still) used by many to benchmark their rigs and see just how high the graphic settings could be set before their system would choke! The game was a graphic masterpiece although the A.I. was a little on the short bus side the original Crysis was a classic sandbox shooter with all the trimmings that garnered a huge following and community that still exists today. In 2019 a team of Scientists makes a frightening discovery on an island in the SouthChina Seas. All contact is lost with the team when the North Korean government quarantines the island. The US sends in a squad of elite Delta Force Operatives to recon the situation. When tension arises between the two nations a massive alien ship reveals itself, previously hidden on the island. Now with all hope fading, the two Nations must join forces to destroy the alien menace before it’s too late. So for 1600 MSP on Xbox Live or $19.99 on the PlayStation Network you can save the world that is Crysis on the consoles. Not a bad price considering that the full game sells for $29.99 on Steam and Origin for digital download on the PC. So what’s your opinion? 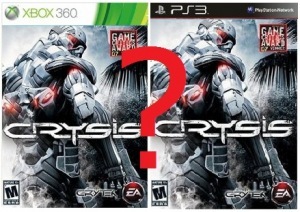 Is Crytek selling out even more or what? Leave a comment and be heard! I didn’t like it anyways, graphically, I prefer Unreal Engine.